Day 1: Transfer by train from the border, airport or any other destination in Switzerland to St. Moritz. Short walk to your hotel, check in and leisure time. King Carl Gustaf of Sweden is only one of the many prominent guests of St. Moritz. St. Moritz is often called an Alpine metropolis. There are numerous luxury hotels, spas and upscale shops against an Alpine background of lakes and mountains. Overnight in St. Moritz. 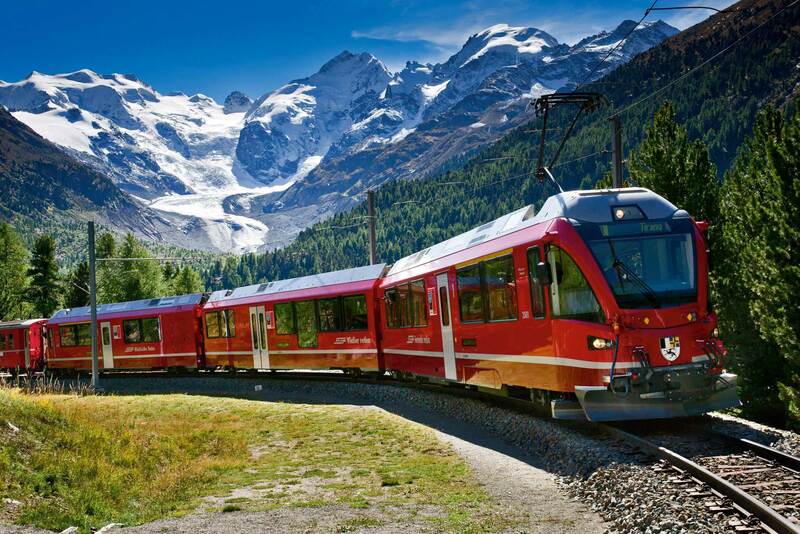 Day 2: Board the narrow-gauge Bernina Express at St. Moritz station and enjoy one of the most impressive scenic rail journeys Switzerland has to offer. Climbing over the spectacular Bernina Pass to more than 2253 m you pass snow covered mountain peaks and glaciers then descend towards Poschiavo and Brusio. Travel over circular viaducts and pass through winding tunnels before reaching Tirano in Italy which is the end of the Bernina line. Change to the Bernina Express Bus which will take you onwards to Ticino. Through the vineyards of Veltlin and along the banks of Lake Como this lovely journey ends in Lugano – Southern Switzerland’s largest town. Overnight in Lugano. Day 3: After your breakfast you have more leisure time in Lugano, the largest town in the holiday region of Ticino. Lugano is not only Switzerland‘s third most important financial centre and a conference, banking and business centre, but also a town of parks and flowers, villas and sacred buildings. With Mediterranean flair, Lugano offers all the advantages of a world-class city, combined with the cachet of a small town. Transfer by rail to the airport/border for your departure back home or to your next holiday destination.